The Key Moments collection is a great way to hold your precious 'moments' crafted in Sterling Silver. Build your collection to celebrate your on-going story and wear a different combination in a Key Moment's medallion depending on the occasion. This set offers the wearer love and luck, reminding them that they are blessed each day. 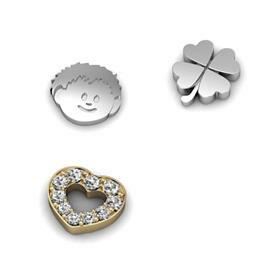 Featuring three charms, the Gold-Plated love heart, Silver four leaf clover and Silver boy or Silver girl. NOTE - Let us know whether you would like a boy or girl in your order comments.